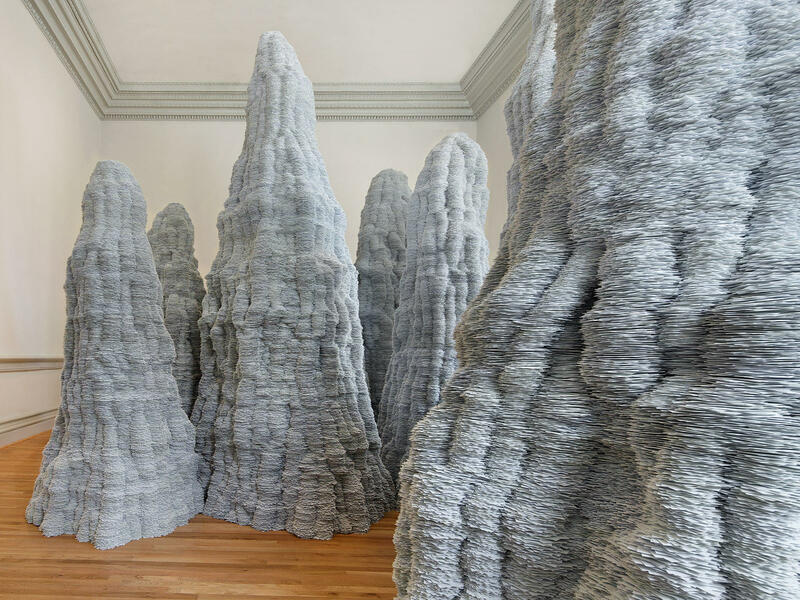 You may have thought you used mountains of index cards while working on school research papers, but Tara Donovan shows you what mountains of index cards actually look like in her installation for the "Wonder" exhibit. Stick sculptor Patrick Dougherty creates nests in his 2015 work Shindig. 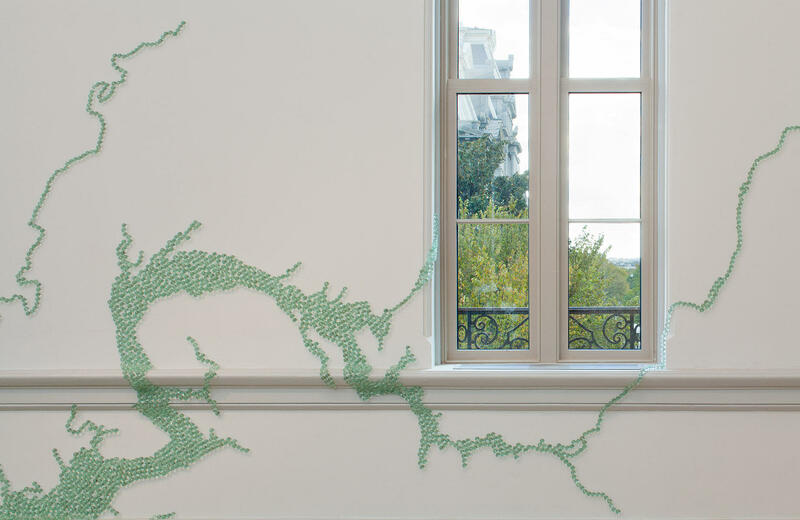 Artist Maya Lin made a map of the Chesapeake Bay using blue-green marbles. John Grade modeled this tree on a 150-year-old hemlock he found in the Cascade Mountains. Lin's Folding the Chesapeake travels all over the gallery. Data from NOAA showing the 2011 tsunami in Japan helped inspire artist Janet Echelman's work. 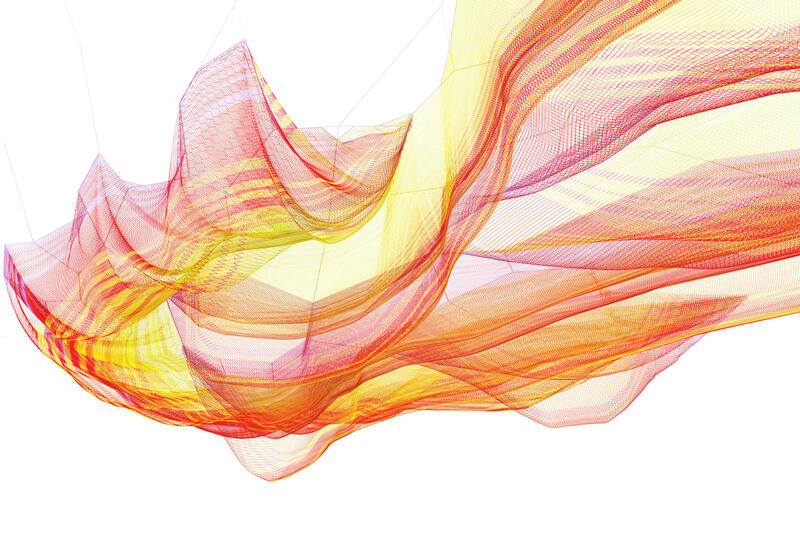 A rendering of Echelman's installation shows a billowing, color-changing net, suspended overhead. Gabriel Dawe used 16 different shades of thread to make the colorful spectrum he calls Plexus A1. Look closely — the patterns in Jennifer Angus' In the Midnight Garden are made up of dead bugs. When you were a little kid, everyday objects could be amazing — twigs, bugs, old tires, there was potential in everything. And it's that sense of awe that the Smithsonian's Renwick Gallery is trying to recapture in its new show, Wonder. 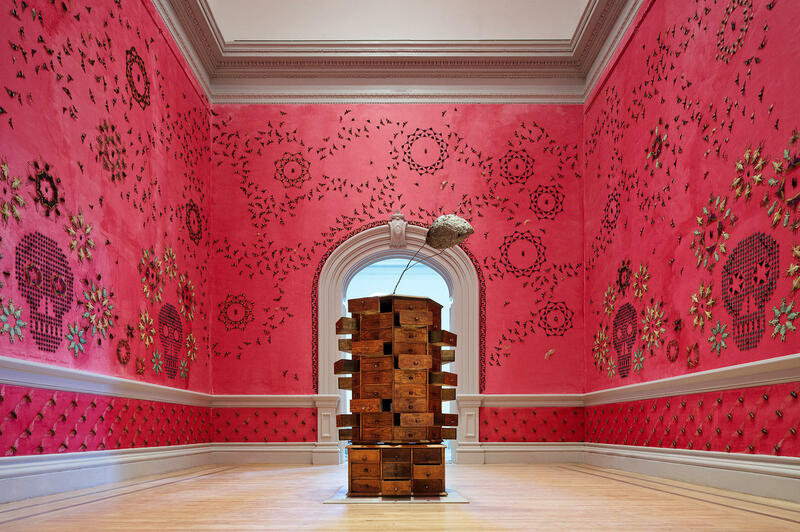 In the Renwick's newly renovated gallery in Washington, D.C., nine artists were each given free rein over a space to create inspiring installations. 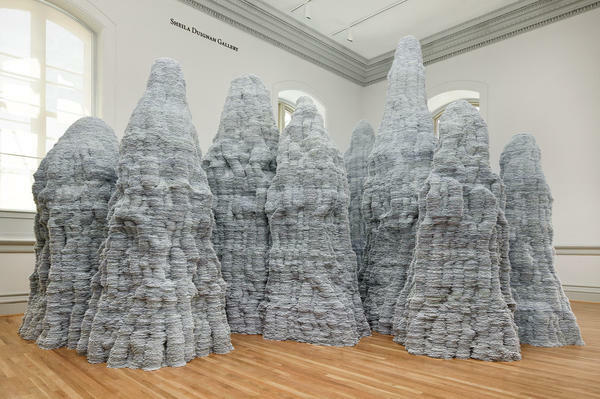 Tara Donovan used hundreds of thousands of index cards to create a mountain range. 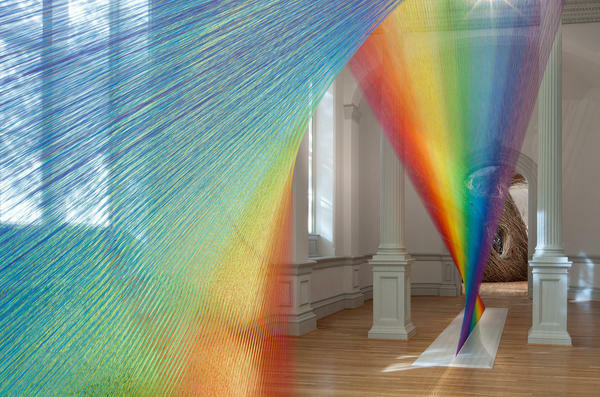 Gabriel Dawe made a rainbow out of some 60 miles of colored thread. 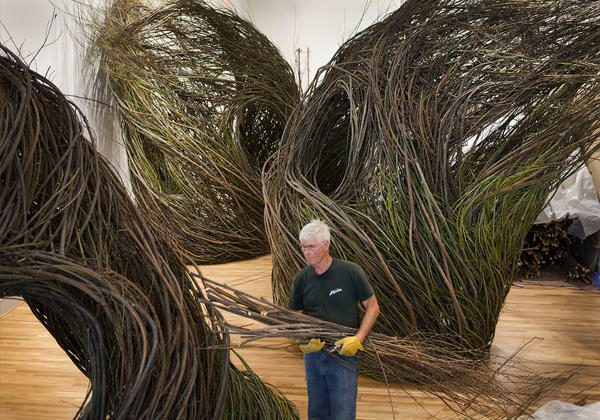 Patrick Dougherty turned sticks into giant, swirling nests. "I wanted people to be overwhelmed, to feel as if there's something in the world greater than yourself," says Renwick curator Nicholas Bell. He spent over a year reflecting on wonder — that feeling you get before mental clutter like "intellect" and "taste ... drown out the senses," as he puts it in the show's catalog. The Renwick was closed for two years for renovations, and for its reopening, Bell looked for artists who would transform the building's spaces. Seattle-based artist John Grade told Bell he was going to "bring" him a tree. Bell wasn't entirely sure what Grade meant. "I'm going to find a tree that is the same age as your building and I'm going to build it for you," Grade explained. The Renwick was built more than 150 years ago, so Grade went to the Cascade Mountains and found a hemlock tree of a similar vintage and made a plaster cast of it. "They rigged up ropes and they covered this whole tree with tin foil so that it would protect it, and they covered it with plaster," Bell says. "They popped these pieces of plaster off the tree and took them back to his studio. Then they used that as a mold. So they had hundreds of volunteers coming in off the street — people on their lunch hour, people coming in after work and on the weekend." Those volunteers helped Grade rebuild the tree using a half a million small blocks of reclaimed wood from a bridge that was being torn down. At the Renwick Gallery, the tree is now suspended on its side, filling the entire room. The natural world is where most of these artists found their wonders. 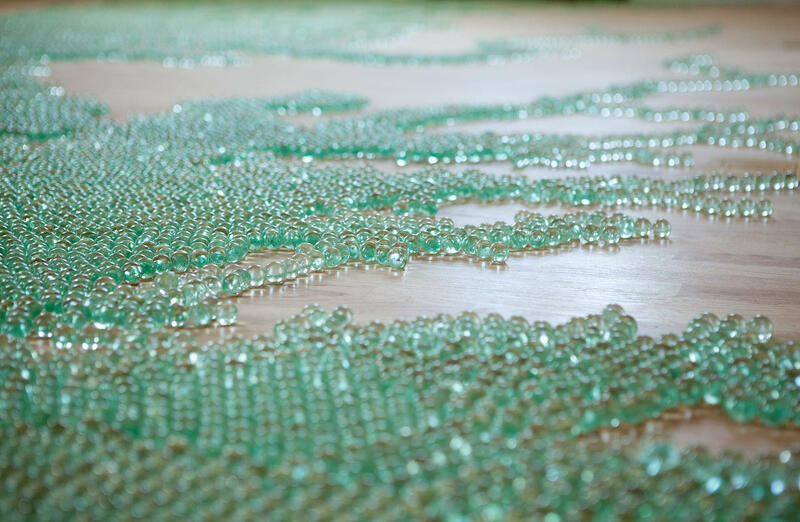 Maya Lin created what she calls a "jewel-like map of the Chesapeake Bay," using clear, blue-green marbles. "If you look at each marble they're not precious," says Lin. "They were very functionally made. They're cracked. They have flaws. But the color to me is probably the closest I can get to capturing the shimmer and glimmer of water." To wonder is also to question, as in: I wonder what that's all about? For artist Janet Echelman, that meant trying to understand a natural disaster — the devastating tsunami that hit Japan in 2011. For the Renwick's grand salon, she created a massive, undulating net, suspended overhead from the 40-foot ceiling. Through a system of programmed lighting and wind movement, the net's colors and billowy shape change slowly, casting shadows on the walls. You almost feel like you're underwater. Echelman was inspired by data from the National Oceanic and Atmospheric Administration. "It's the wave heights across the entire Pacific Ocean from the tsunami that hit Japan," she says. "And it's about these deeply held interconnections and interdependencies, some of which we understand and some of which we don't understand and can't predict. So it's my own personal way of making sense of the world." In another room, artist Gabriel Dawe has created a kind of prism of two intersecting columns in a rainbow of color. At first glance, the structure looks like some kind of computer-generated hologram. But no, it's made entirely out of thread in more than 16 different colors. Dawe says his attraction to thread goes all the way back to his childhood in Mexico City — he was told that he could not embroider because he was a boy. As Dawe was exploring the links between fashion and architecture, he thought: What if I do an architectural structure with the core material of clothing? Here, he says, he's "using the material of one in the scale of the other and creating some new type of structure that hasn't been done before." That childhood sensation of being awestruck — the "wow" factor — is what Bell wants visitors to feel as they walk through "Wonder." And what better way to inspire "wow" than with exotic bugs? Jennifer Angus created an elaborate, floor-to-ceiling pattern from grasshoppers, cicadas, moths, beetles and other insects. Yes, they are real, and yes, they are dead. Most of the bugs were farmed or caught wild in Southeast Asia. Some are nearly 10 inches long. Angus has a background in textiles. As she was doing research on tribal dress in northern Thailand, she came across a shawl. "And on the shawl's fringe were strung green, metallic beetle wings — just the very same beetle wings that I have on the wall." says Angus. "I was really amazed. I had never thought of insects as beautiful beyond butterflies. But gradually I found that I was just more and more interested in them." That's how it works. Great learning begins with wonder. Wonder will be on view at the Renwick Gallery in Washington, D.C., until July 10, 2016. When you're a little kid, everyday things can be amazing - twigs, bugs, even old tires. It's that sense of wonder that the Smithsonian's Renwick Gallery in Washington, D.C., is trying to capture. And its new show in the newly renovated art museum is called Wonder. NPR's Elizabeth Blair reports. ELIZABETH BLAIR, BYLINE: A mountain range made of hundreds of thousands of index cards. A rainbow made of miles of colored thread. Giant nests made of sticks - mine artists, nine installations in nine spaces. The Smithsonian is really going for the wow factor here. NICOLAS BELL: I want people to be overwhelmed, to feel as if you're - there's something in the world greater than yourself. BLAIR: Curator Nicolas Bell has spent a lot of time thinking about wonder, that feeling you get before mental clutter like intellect and taste drown out the senses, as he puts it. Bell looked for artists who would transform the building's spaces, like Seattle-based artist John Grade. He told Bell, I'm going to bring you a tree. BELL: I said, John, I don't even know what you mean. He said, I'm going to go find a tree that's the same age as your building, and I'm going to build it for you. BLAIR: The Renwick was built over 150 years ago. John Grade went to the Cascade Mountains and found a tree that's about that old and made a plaster cast of it. BELL: They rigged-up ropes, and they covered this whole tree with tinfoil so that it would protect it, and they covered it with plaster, and then they popped these pieces of plaster off the tree and took them back to his studio. And then they used that as a mold. So they had hundreds of volunteers coming in off the street - people on their lunch hour, people coming in after work and on the weekends, saying, I want to build a tree with you, John. BLAIR: Those volunteers helped John Grade rebuild the tree using a half-a-million small blocks of reclaimed wood from a bridge that was being torn down. 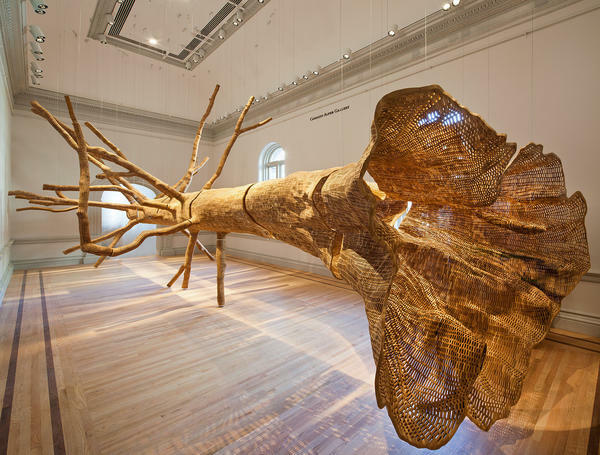 At the Renwick, the tree is now suspended on its side, filling one room. The natural world is where most of these artists found their wonders. Maya Lin created what she calls a jewel-like map of the Chesapeake Bay using clear, blue-green marbles. MAYA LIN: If you look at each marble, they're not precious. They were very functionally made. They're cracked, they have flaws. But the color, to me, is probably the closest I can get to capturing the shimmer and glimmer of water. BLAIR: To wonder is also to question - I wonder what that's all about? Artist Janet Echelman was trying to understand a natural disaster, the tsunami that hit Japan. For the Renwick's grand salon, she created a massive undulating net suspended overhead from the forty-foot-high ceiling. The net's colors and shape change slowly, casting shadows on the walls. You almost feel like you're underwater. Echelman was inspired by data from NOAA, the National Oceanic and Atmospheric Administration. JANET ECHELMAN: It's the wave heights across the entire Pacific Ocean from the tsunami that hit Japan. And it's about these deeply-held interconnections and interdependencies, some of which we understand and some of which we don't understand and can't predict. So it's my own personal way of making sense of the world. BLAIR: Curator Nicholas Bell wants visitors to the show Wonder to feel that childhood sensation of being awestruck. Bugs - giant exotic bugs. That should do it. JENNIFER ANGUS: Here are some grasshoppers from Madagascar. BLAIR: With grasshoppers, cicadas, moths, beetles and other real but dead insects, Jennifer Angus created an elaborate floor-to-ceiling pattern. She says most of the bugs are from Asia. Some were farmed, some were caught wild. Angus has a background in textiles. She had a eureka moment when she was doing research on tribal dress in northern Thailand and came across a shawl. ANGUS: And on the shawl's fringe were strung green metallic beetle wings, just the very same beetle that I have up on the wall. And I was really amazed. I never thought of insects as beautiful beyond butterflies, but gradually I found I was just more and more interested in them. BLAIR: That's how it works. Great learning begins with wonder. Elizabeth Blair, NPR News, Washington. Transcript provided by NPR, Copyright NPR.